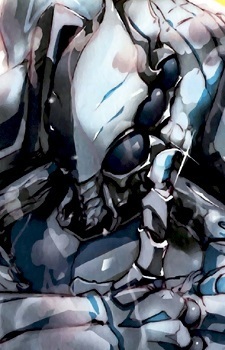 Cocytus is the floor guardian of the fifth floor in the Great Tomb of Nazarick. He is a hybrid between a mantis and an ant. He was created by Takemikazuchi. Having an enormous body size of 2.5m, Cocytus has the appearance of an insect walking on two feet - a fusion between a mantis and an ant. With a tail twice as long as his height, Cocytus is covered with sharp spikes like icicles and has a strong jaw that can easily snap people's hands. Two of his hands hold a silver halberd, while the remaining two hands hold a mace emitting black light and a crooked shape sheath which seems to be for a broadsword. With a breathtaking cold air, the pale blue, hardened bone armor oozes out diamond dust like bright light. His shoulders and back look like an uplifted iceberg.